Theanine is an amino acid found in green tea that produces calming effects in the brain. For centuries, green tea has been used in the Orient for its relaxing properties. 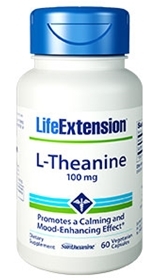 Life Extension Foundation members can enjoy the benefits of this unique ingredient in a 100-mg supplement — L-Theanine. A “feel good” supplement, theanine causes no adverse reactions. In fact, in Japan, soft drinks and chewing gum are spiked with theanine for the purpose of inducing relaxation. The calming, mood-enhancing effect comes with no strings attached— it won’t make you drowsy or groggy, it simply relaxes you by helping to increase alpha-brain waves, electrical brain activity commonly present when you are very relaxed, literally putting you in a better mood. Animal studies have shown that theanine increases GABA (gamma-amino-butyric acid), an important inhibitory neurotransmitter in the brain. GABA can be considered the brain’s natural sedative. Other animal studies found theanine was able to increase levels of dopamine, another brain chemical with mood-enhancing effects. Just as meditation, massage, or aromatherapy quiets the mind and body, so too theanine plays a role in inducing the same calm and feeling of well-being. Everyone except babies can enjoy this non-toxic, highly desirable mood modulator. Suntheanine is a registered trademark of Taiyo International, Inc. Use of Suntheanine is protected by U.S. Trademark Reg. No. 2548957.